"I'm sorry Mummy, I'm so sorry I made you angry, I'll be good, I promise I won't do it again." Which may not sound completely awful - unless you consider that the child may have done nothing wrong - and that the flare of anger was being dumped from another issue the parent had. Perhaps something that they had failed to resolve elsewhere in their life, and that they were simply using the child as as a focused outlet for that unresolved anger. There is, after all, always something that can be criticised to justify the anger if no-one challenges your behaviour. If your desire is to remove the bad feelings from yourself without considering what the effect of frequent and really unjustified criticism can have on a child then its a very effective strategy. absolve them of their "sin" of abuse, carry the guilt for causing the abuse - because they are taught that they are always the cause of their own abuse. and then to have someone who not only absobrbs all of that - but also agrees they deserve it. All that's missing is a desert to wander off into and die. Why does the role of scapegoat often start with a child - well they need a little persuading that they deserve that treatment - its easier to grow them into it, after all a well balanced and self respecting adult would be quite difficult to persuade that they were to blame for some of the outrageous things a child being groomed into the role might be asked to consider their fault. And it is worth noting that it is the impotence of the adult parent and their inability to deal with the real authority figures in their lives that causes them to cast about for someone with less power than them. It is after all a very covert form of bullying - and bullying doesn't happen to someone higher up the pecking order than the bully. This is a difficult question because the script is so repetitive and similar and it is a way of behaving that is so commonly fallen into in families with Narcissists that it would seem to be part of the unconscious dynamic of families like this - and yet, when the question is asked by anyone who identifies themselves as the scapegoat, what they may more precisely mean is - why was it me ? Because after all it feels so unreasonable and unfair - and it is - it is completely unfair. 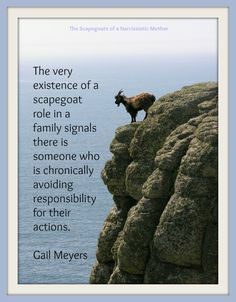 I have read over and over - with only limited explanation- that the role of the scapegoat is better than its opposite which is the golden child, yet, that seems counter intuitive - and at the point of realising you are a scapegoat its pretty hard to see the benefits of the role at all. That answer has some truthful elements, but they can be quite hard to see initially. In narcissistic families there is only one parental opinion - this is supported by the other parents who may play the role of the enforcer, or bystander, or any of the other roles assigned to them - but the opinions which come from "the parents" (as a unit) are effectively singular - and belong to the narcissist. So - for instance a family of two children - the narcissist could find one child easier to get one with - their thinking may be more "similar" to the parent and the other will be more alien. There will be more disagreements - separation is greater - conflicts more common.This is especially true at an age when a child is growing apart from their parents, one may well be be more different - by nature (if not by nurture). Other sibling (s) will not be slow to recognise that difference and expoloit it. The competition for parental attention, even in a well adjusted family, is huge. It can be especially so in a family where the parents are ruled by a Narcissist. All the spare emotional energy will be fed into the Maw of that need for narcissistic "feed" and there will be little available to any children no matter what their staus within the family. So the siblings compete for scraps and any reason to create distance, pushing one further away from available resources, will undoubtedly be exploited. there is an advantage to the other children in joining in with scapegoating a sibling, it can bring a child closer to the parents, create a shared bond - make them "Golden" more the same - more approved of. It can quickly and easily becomes a family "thing" a way of becoming a team with the parents on the same side against a common "enemy" and a way of gaining praise and approval within the family. Dispassionately a sibling wouldn't think through the process by acknowledging their actions are hurting their scapegoated sister or brother. they might not realise that they are gaining anything from the process either - that they do it to make themselves feel better, or more wanted, more part of the group, they may even deny it if confronted- or feel guilt - but would they swap roles within the family? undoubtedly not. The self esteem of any child is normally built on the reflection and approval of them by their parents. The scapegoat ending up with low self esteem and limited feelings of self worth. Something those who escape from this situation often have to spend time working on building. Stepping away from their family of origin for the Golden Child however would be quite different. They would have to be prepared to step away from the source of all of their ego stroking and support, and often a level of self worth that they have never experienced outside their family of origin, often because it is unjustified. Their superior feelings and having a way of externalising blame, guilt and other negative feelings (onto the scapegoat) would be removed.They would therfore have to find more authentic and much less readily available sources of self worth and validation and the simplicity of handling their feelings and the feeling of power they acquired through being the golden child would also be gone. It would be a difficult thing to give up being praised. It is after all nice to be right, nice to be able to vent at the scapegoat and always be better than someone. I am not after all better than this other person who I have used and abused all these years." This is what a golden child would have to deal with if they gave up the role. For the Golden Child to say that they were "not better" would also force them to confront their past behaviours, perhaps to go as far as to admit that their behaviour in the past might have been moraly wrong. It would also show up that their parents behaviours were wrong - and showing knowlege of this this would move them into a position of extreme disapproval from their parents - they might even experience narcissitic rage. Precisly what they were trying to avoid when they began on this path in the first place. Few people would be capable of negating themajority of their positive self image to prove a point - after all the benefit to them to take steps along the path to parental rejection are initially very limited. I also suspect they are not going to do it out of empathy for a sibling- because to be a golden child means you are similar to narcissists - who substantially lack empathy in the first place.